Time flies like an arrow (and fruit flies like a banana). Mau’i is a beautiful place even though it was overcast and windy. I realized that I have seen much of the island and this was a time to enjoy the company of good friends. We went out in the boat and saw whales; we walked dogs; we sat at the computer and looked at photos from our past. It’s not a bad thing to have a bucket list, but often times it’s the little things–the personal connections that we don’t think of or take for granted–that are the important things. What is about whales? Is it just their size? Their grace? Yesterday we went out on Ma’alaea Bay in my host, Chuck’s, fishing boat. He’s a commercial fisherman and his eyes picked out every blow. Seen from afar, they are tantalizing little spots on the water, but up close, one cannot help but feel a profound sense of awe. A mother and calf appeared 100 yards from the boat and we watched them roll through the gentle waves, blowing and occasionally showing their flukes as they dove. We were hoping to see one of them breach, but that wasn’t to be. Just seeing these majestic creatures, much bigger than the boat, was enough. Later we saw a pair of adults. They moved almost in unison, undulating slowly through the sea. In the far distance an adult breached twice. As a tourist, I often find myself looking for the spectacular, the incident to talk about, “Yeah, I saw a huge Humpback breach right in front of the boat!” But the true joy in this outing for me was just drifting in the gentle swells, looking back at the two volcanic cones that form the island of Mau’i, feeling very small in the vastness of whales and the sea. One of the things I found when I first went to the southern hemisphere is that things I didn’t think I noticed actually had been imprinted. If you had asked me if I knew the stars in the northern sky I would have said I knew a few constellations if I looked for them, but otherwise, no. The first night I had a chance to be under the stars, I immediately found that I was looking into the sky for something familiar. There was no Big Dipper, no Polaris, but a new signature constellation, the Southern Cross. I took a while to get used to it, but then I started to notice some familiar constellations faint in the northern sky. When I got here, the doves in the morning were familiar. As I hiked up the Waihee Ridge Trail, a whole new set of bird songs were audible. As the trail climbed out of the meadows and into the woods, those songs changed. As I climbed further out the woods and into the clouds, the songs disappeared altogether. Henry Lickers, a Mohawk scientist at Akwesasne (and the head of the Environment Division of the Mohawk Council of Akwesasne) has developed a theory of natural knowledge. Essentially the idea is that we learn things about our natural environment that help us survive. Those things aren’t necessarily learned consciously, but sometimes they go directly from our senses to our judgment centers without passing through language that converts them into the symbols that our rational mind processes. When I visit a place, I start that process of accumulating natural knowledge. It doesn’t progress very far—I don’t have survival needs that depend on it—but some of it stays with me. Some of the bird songs in Hawai’i stick with me. I have learned that the rocks aren’t as sticky and I have to be more careful walking on them (although it sometimes takes a fall on my keister to remind me). There are a myriad of things I know rationally about the area—Centipedes give a painful bite, lava comes in different types—but it’s all very cerebral. I am a babe in these woods. One of the things about Hawai’i that always catches me off guard is the fine grain of diversity here. You can be driving through a cloud forest and 3 minutes later you are in a brown desert. Or a red desert or a golf course farm. The same is true of the culture. One minute you are in a community of condos, the next in run down shacks. Not that the folks in the run down shacks are any less happy or interesting than golfers in plaid pants, mind you. The stretch of road between the Ma’alaea Harbor and Lahaina captures a lot of this. There are tended beach parks along the way and there are stretches of beach in between that are untended and trees grow over some of the beach. The latter are often occupied by people who are squatting there for the long term. Periodically the authorities come around and kick them all out, but they return. Both types of beaches are used by tourists and natives alike and while the difference is generally pretty apparent, they coexist amiably for the most part. There is a dot of a town on this road, Olowalu (“many hills”), that captures this fine grain diversity. There is the Olowalu General Store and the Olowalu Juice Stand. And that’s it for business. Taking a turn toward the ocean in Olowalu leads you within yards to a gated private home, but a dirt track to the left leads around the private property to the sea. There is a parking lot and a short walk to the edge. Turning right leads to a mown lawn, part of which is private and part public, and a jetty. 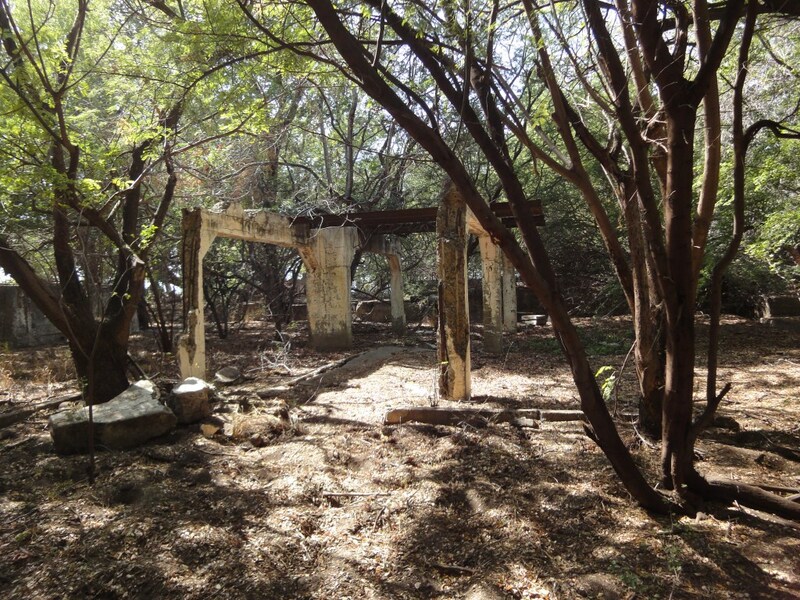 Some other interesting features of the place were the skeleton of a building of some kind, possibly an ammunition bunker, and the huge stump of a tree that must have been cut down 50 years ago. Is how you pronounce ’Iao Valley, “valley of dawning inspiration.” It’s a lovely, lush valley that cuts into the volcanic cone that forms West Mau’i. 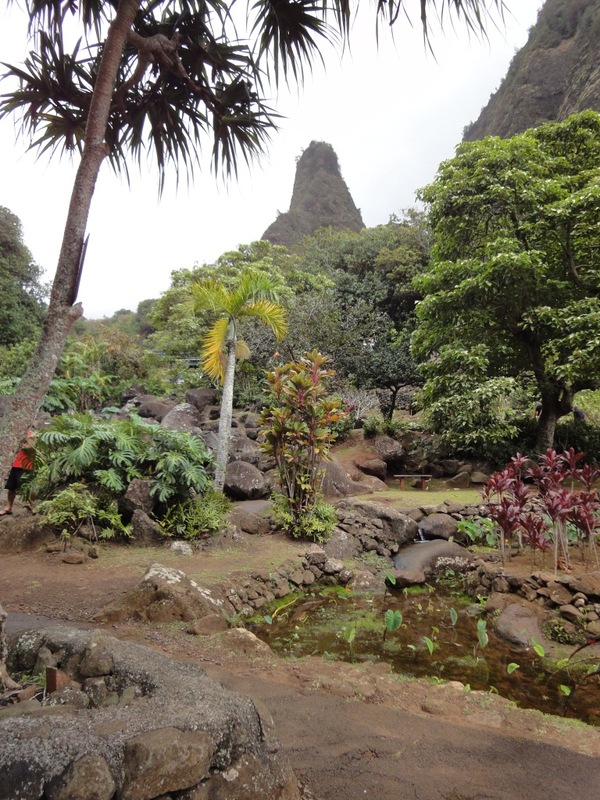 Once reserved for Hawaiian royalty, it is now the home of a number of botanical gardens and exporters. 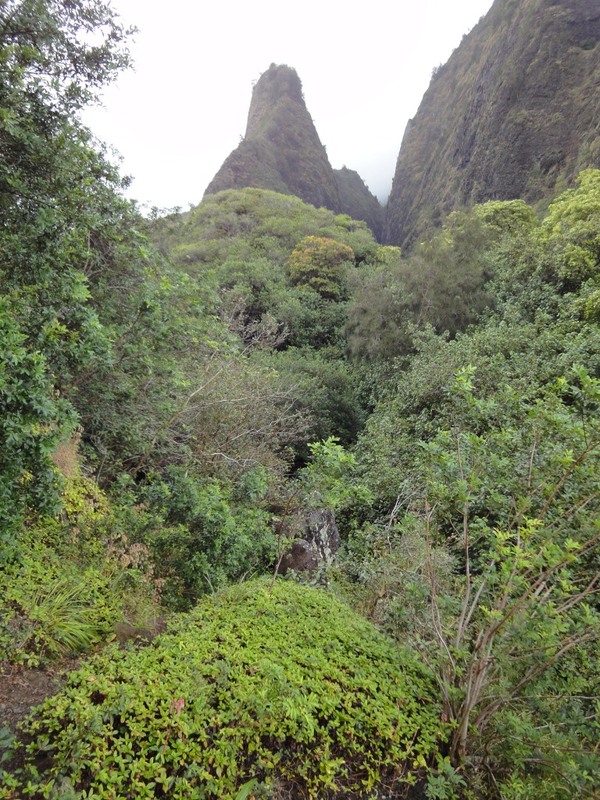 The physical feature that sets it apart is the ‘Iao Needle. This is typical of the suburban homes in Hawai’i. There is a fenced courtyard around a single story building built on a slab (so no basement). They are often masonry, a material that resists termites. 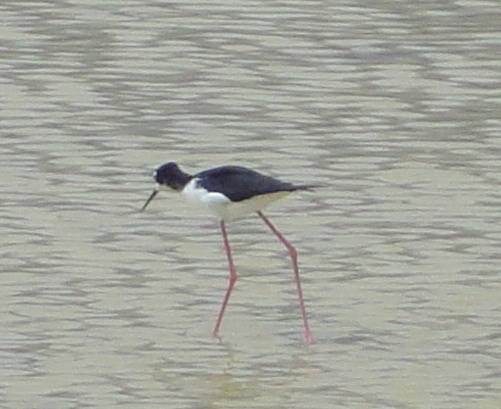 There are only 1,500 of these ae'os in the state, but many of them are found here in Kanaha Pond. 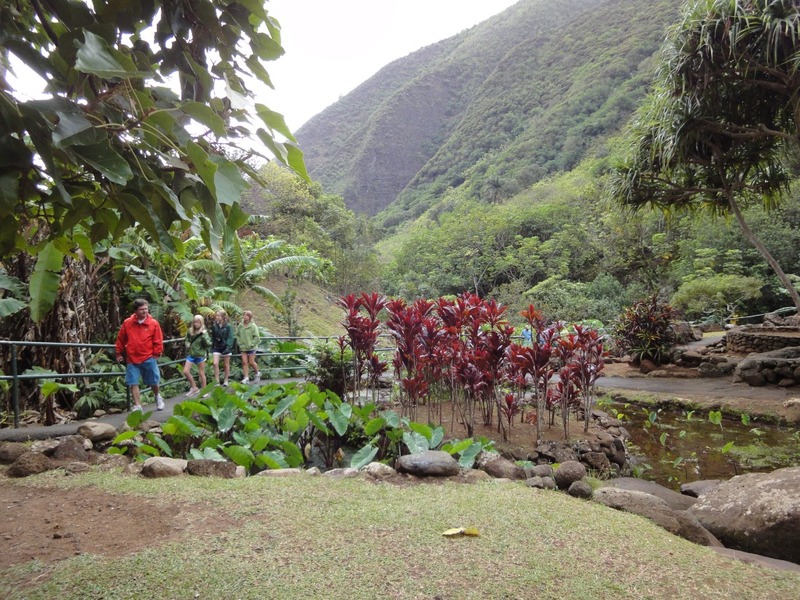 This shot of the Kanaha Ponds Bird Sanctuary captures many of the aspects of Kahului. The birds are barely visible in the foreground, but there are several feeding on the mud flats. In the background is the smokestack from the power plant and West Mau’i crater. Not visible behind me is the airport and farther out to my left are large fields of sugar cane. There’s something about traveling from a place that is sub-freezing and snowy to someplace that is warm, damp and lushly green. The first time I did it I left Syracuse in a February snowstorm, flew through Cleveland where the smoking hulk of a FedEx plane that crashed on landing was being swarmed over by NTSB investigators, through LAX, where smoking hadn’t yet been banned, on to Honolulu where I missed my connection to New Zealand, on to Sydney, Australia, and finally, after 40 hours on to Auckland. I got off the plane about 6 PM, local time, and was treated to a beautiful sun setting over a palm tree in the parking lot. I had to pinch myself. And even though my flights were on time and the last long leg to Mau’i, uncrowded, I was not ready for the change. First, I had dressed in heavy jeans and a lined cotton shirt (I hate that when I don’t think! ), but I had also used the trip to finish William Dalrymple’s first book, In Xanadu, where he recounts his attempt to follow Marco Polo’s route from Jerusalem to Kubla Kahn’s summer seat in Xanadu. I have always aspired to be a travel writer and will never become one because I lack the courage to travel to such places. My most exotic trip, to the Republic of Georgia, was made possible because I was visiting Zeke, who does have the courage. But I do live vicariously through writers like Dalrymple, Bruce Chatwin and my favorite, Bill Bryson. So as I sit here comfortably in my friend’s ohana, I raise a glass to all those who dare to step out into the unknown, to try to learn Pashtoon but communicate even if they don’t succeed. May they live long and write much! So when I got to Chicago, I bought Wi-Fi service and looked up a few bits of information. I even managed to find a plug to charge my computer for a while and was busying myself on it (looking at pandas sneezing and cats drinking out of the toilet—just can’t get enough of that!) when I realized it was almost time for my flight to board. I abandon my outlet (which, judging from its inability to hold the plug without bending the prongs radically inward, had been used by thousands of desperate travelers over the years) and got ready to board. Arriving in LA, I promptly rehydrated at the bar and then found I had neglected to get some crucial pieces of information. I bought more Wi-Fi service and got the reservation # (which I didn’t need) and the name of the rental car company (which I definitely needed!) before I boarded. What I didn’t get was the information on how to get in the gate at my friends’ house. Or their address. When I arrived at the rental car place and the sweet girl at the counter used her smartphone to find their address for me. I got my rental truck I went to plug in my GPS to find the place in the dark, rainy and windy night, it wouldn’t work. I blamed it on the power point (the new name for cigarette lighter since we no longer smoke, but still need the hole the lighter came out of to power our myriad of technology). Before long, though, I found that, consistent with the behavior of my technological aids, the tip of the GPS’ power adapter had fallen out and was not to be found. Now, this is not the first time I’d been there, but I knew that even if I could have found a map with Kauhikoa Rd. on it, it would have been difficult to find the place in the inky blackness of a dark and rainy night even if I hadn’t been up for 22 hours. So I ended up renting a GPS. And it was ten bucks well spent and I found the driveway with a minimum of wrong turns. Did I mention that there is a gate (the need for which was borne out by a story of their dog staring down two masked, armed men in camouflage)? Naturally, the gate was closed. There was no intercom but there was a keypad. I fired up the computer (with 9% charge), looked at the email and found there wasn’t a gate code. Now what? Well, I could drive back to town and call. Doh! The phone number is in the computer and the phone. I went to fire up the computer again, but it wouldn’t because the battery was too low. I could climb the gate and walk up to the house, but I also know they have dogs, who, nice as they are, don’t know me and might take offense to my audacity. Just as I was about to reconcile myself to sleeping in the truck, I decided to honk a little more aggressively. Voila! The gate began to open and Chuck is walked out to greet me. I managed to get out the door at 4:25 and arrived in what I thought was plenty of time. The ticket counter was slow (I think they were waiting for their second reprinting of a 42 page report on an Epson dot-matrix printer, hadn’t heard THAT sound in a while), and despite the diminutive size of the Watertown Airport, security was very thorough…and slow. My extra weight helped me avoid losing my pants while I sent my suspenders through for screening and re-dressing was fairly quick, but the plane was boarding when I got through. It’s a very efficient operation, though. The woman who was printing the report gave me my boarding pass and was there to take it back when I boarded. Later I noticed she was driving the de-icing tractor. The pilot got on and said Air Traffic Control was delaying our take off for 3 minutes. I’m guessing that’s how long it took the woman to park the tractor, take off her coat and walk to the control booth (I didn’t actually see a tower).